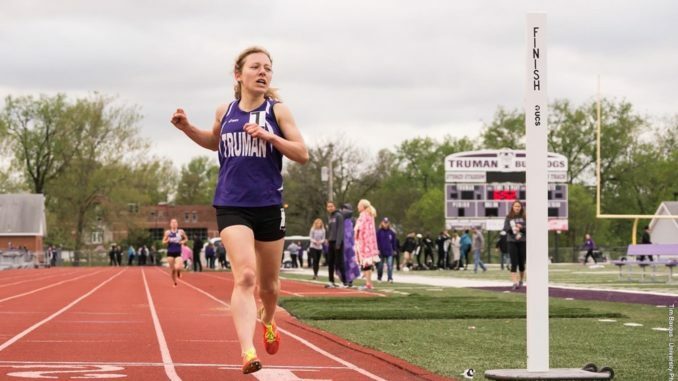 After more than a month off competition, last weekend Truman State University men’s and women’s track and field finished on top at the Snow Bird Indoor Meet hosted at Illinois College. The men took home wins in 6 events — the 200 meter dash, 4×400 meter relay, 800 meter run, 4×200 meter relay, triple jump and weight throw. Sophomore Eddie Barrett ran 22.6 seconds in the 200 meter dash to finish first in a pool of 54 runners. Senior Brice Pavey ran the 800 meter race in 1:58.41 to earn another individual gold on the men’s side. In the field, freshman Brandon Hackamack climbed to the top of the podium in triple jump and collected silver in the long jump. Junior Sam Stewart also earned top spots on the weekend, earning gold in the weight throw and silver in the shot put. The Bulldog women earned four top finishes of their own in the 3,000 meter run, shot put, 4×200 meter relay and high jump. After a dominating cross country season, senior Laura Tarantino, an all-GLVC distance runner, picked up right where she left off. Tarantino crossed the 3,000 meter finish line nearly 50 seconds ahead of her closest competition. Senior Sydney Cornett tied the high jump with three other athletes, clearing 5-5, but Cornett did stand out with the fewest misses of any of the competitors. After a breakout freshman season that ended in a 15th place finish at the NCAA Div. II National Championships, sophomore Cassidy Smestad once again found herself atop the podium in the shot put. Smestad threw 43-5.75. With this success in the first meet, back from Winter Break, the ‘Dogs will now get a chance to find their groove, competing in four meets in the next month. Looking ahead, the ‘Dogs prepare to compete at the Jayhawk Classic at the University of Kansas this weekend. Junior thrower Claire Vasilis said last weekend was a good opportunity for the team to get a good mark this weekend and in future indoor meets. Indoor Championships are Saturday, Feb. 25 in Indianapolis. With little break, the team will almost immediately head into outdoor season whose championships take place at the end of May.